A lot was revealed by former FBI Director James Comey’s testimony before Congress, but I’m going to focus on the Republican defense. Several times during his testimony Comey said the president lied. The first defense from the White House and Trump’s private lawyer was “the president is not a liar.” They decided to label Comey as the liar, which works among Trump voters. CNN had a panel of nine Trump voters in Ohio and each one said they believed Trump over Comey. There’s no accounting for stupidity. But hey, keep working that 37% approval rating. It’s not a huge revelation that Donald Trump lies. Before he started licking Trump’s boots, Ted Cruz described him as a pathological liar, and he should know, being that he is one himself. What is really bizarre is the White House defense that James Comey is a liar and his testimony validated Trump. How can you have it both ways? I thought Trump said Comey was a “nut job” but now we’re to believe him selectively? One revelation from the hearings is that Comey released details of his memos to The New York Times through a friend. Comey said he decided to release the memo after Trump tweeted that “Comey better hope there are no tapes of their meetings in case he decides to start leaking.” That encouraged Comey to “leak” in hopes that it would create a need for a special counsel. It worked. Today there is a special counsel investigating the Trump/Russia connection. I seriously want to play poker with Donald Trump someday. Trump’s lawyer said that The Times story was the day before Trump’s tweet. That in itself was a total lie. It’s not true. We can call that “fake news.” Trump might want to take the investigation seriously enough to hire a good lawyer and not the Lionel Hutz currently representing him. After the lawyer said that Trump NEVER asked Comey for his loyalty, he explained that there wouldn’t be anything wrong if Trump had asked for his loyalty. Seriously, Trump. Get a good lawyer. Another defense and focus was why didn’t Comey tell Trump it was inappropriate to meet with him alone (shoo everyone else out of the room) and to press for him to drop the investigation into Michael Flynn. Why didn’t Comey say something when Trump invited him to dinner only to discover upon arrival that it would only be him and Trump. That’s like inviting a girl over to a party and there’s no one else there. Republicans don’t focus on the part where Trump was inappropriate and possibly obstructing justice. They want to know why the guy who towers nearly seven-feet tall didn’t body slam the president like he was a reporter asking uncomfortable questions in Montana. Republicans can’t expect Comey to call out the president for being inappropriate when they refuse to do that themselves. Another sticking point for the GOP was the word “hope,” as in Trump telling Comey “I hope you can end the investigation.” They believe “hope” is like in Star Wars “A New Hope” in that you “hope” the farm boy can defeat the empire and not “hope” like your boss telling you he “hopes” you meet a deadline. My favorite defense came from Speaker of the House Paul Ryan whose argument is that Trump doesn’t know what he’s doing. Seriously. Paul Ryan just made the argument that every Democrat made before November and 62 million Americans ignored. Donald Trump is not qualified to be president and doesn’t know what he’s doing. Not knowing what you’re doing is not a defense for breaking the law. Since Trump’s tweeting has already made things for him go from bad to worse, the White House kept him busy with shiny objects during the hearing so he wouldn’t implicate himself any further. He’s tweeted himself into being investigated by a special counsel. He’s admitted he fired Comey to take the pressure off from investigations. He told Comey that he never had hookers….in Russia, and that was because he assumed they recorded everything over there. When Trump would bring up the hookers story to Comey he never used the defense that he was married and loyal. He also never expressed concern with Russia’s tampering in our election and Democratic process, only with being investigated. Trump found the location where his staff hid his phone (next time put it in a book or a salad), and tweeted this morning. 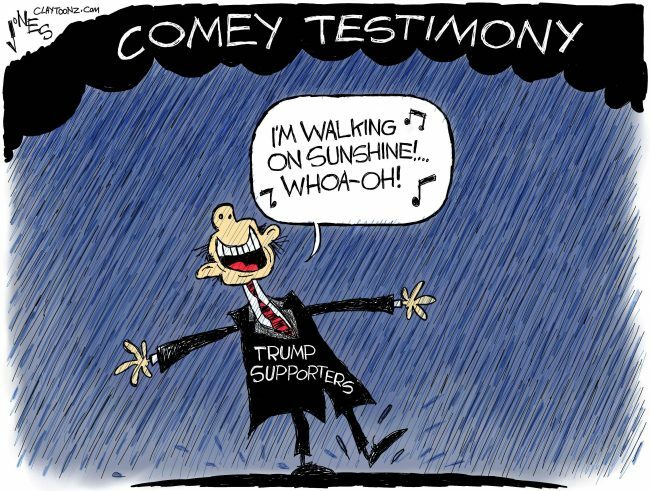 Trump tweeted “Despite so many false statements and lies, total and complete vindication…and WOW, Comey is a leaker!” Is he stating he has complete vindication despite his false statements and lies? Perhaps the biggest thing about this is that Republicans continue to overlook the most substantial fact: Donald Trump fired the man heading an investigation into his presidential campaign. But then again, Donald Trump doesn’t know what he’s doing.